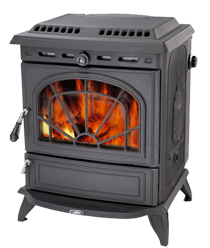 County Woodburning Centre have been retailing and installing wood burning stoves and range cookers since 1961, we are famous for friendly, knowledgable and professional customer service. Here's what some of our customers have to say! I felt I must email you to thank you for a brilliant service! From ordering my Esse range to having it fitted today the service has been faultless. I must make special mention about your fitters Wayne and Liam, they were absolutely brilliant, efficient, polite and completely professional and did a fantastic job. They couldn't do enough and wouldn't leave until they were totally happy that all was working perfectly despite this meaning they didn't leave us till well after most people would have gone home! So once again thank you very much and I would highly recommend your company to anyone wanting this service. "Great service! Clearview 650 installed yesterday. Clean, efficient and no mess..."
"Great service! Stove arrived yesterday. Writing this in front of a beautiful log fire today! ..."
"Great communication, safely packaged items, speedy delivery..."
"Excellent buying experience through County Woodburning Centre. Prompt response, reliable service. Installation team were very professional, polite, neat and tidy..."
"Great service from initial call to fitting, we haven't used the central heating since the stove was installed..."
"Many thanks for supplying and installing our new Aga – we are delighted with it..."
"Thank you so much for the fantastic advice and service, we are delighted with our Charnwood C5..."